LOOKING TO BUY A NATURAL AQUARIUM IN NEW JERSEY? 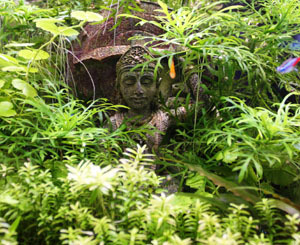 Natural aquariums and aquatic gardens can be impressive and beautiful works of art. Planted aquariums are both aesthetically pleasing and gratifying to create. Whether Dutch or Japanese style, a jungle-Asian system, or Amazon tributary, natural aquariums are unique biotopes and easy to maintain. Looking for Natural Aquariums and Live Aquatic Plants? Lighting, necessary for plant photosynthesis, is an essential component for any natural aquarium. Full spectrum lighting provides optimal photo-spectrums needed for promoting plant growth and health. 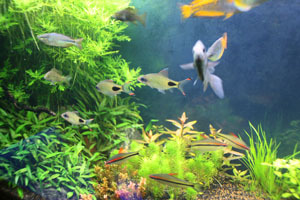 Typically, two to four watts per gallon of full spectrum light is recommended for your natural aquarium. Carbon dioxide is provided either manually with supplements, or auto-injected with an outside CO2 bottle. As well, Nitrogen is also a much-needed requirement for plant growth. Nitrogen is added through liquids or substrate fertilizers. Minor trace elements such as potassium, iron, and magnesium are supplemented for leaf and stem vigor. These elements stimulate photosynthesis and stomata cells, thus leaving your natural aquarium garden lush, green, and full of natural beauty. The Dutch style employs colorful aquatic plants of all types to create a lush underwater garden. The Japanese style, by contrast, uses sparseness and minimalism as sources of great beauty, creating stark and evocative natural landscapes with underwater rocks and mosses. Some prefer to theme their natural aquariums by utilizing bamboo or origin-based foliage to simulate an Asian jungle or Amazon tributary. 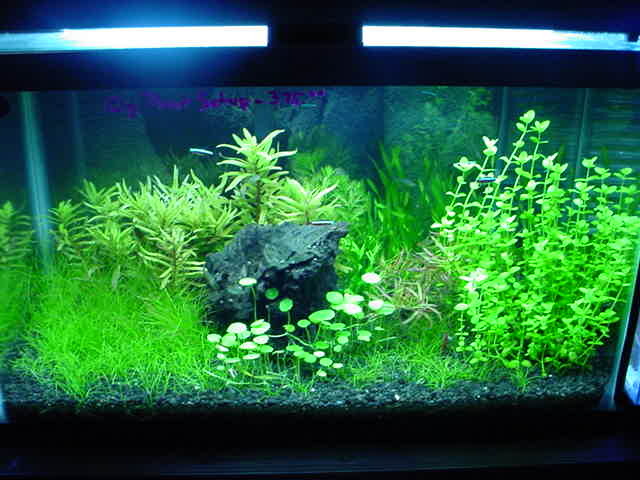 Driftwood, ferns, and slate-levels are usually incorporated in the aquascaping plan. Nothing compliments the natural aquarium more than the creatures inside. The fish you choose for your natural fish tank will have to be considered seriously. You may want to choose fish from a region i.e. : Asia, South America, Africa, or Australia. Most fish compatible with plants are of smaller-schooling nature. Whatever you choose, it is advisable to seek a natural aquarist specialist before purchasing, as some fish will eat plants! Others may dig them up. Fish balance will be very important to the overall aquatic plant health and ecosystem you desire to create in your natural aquarium. You may also decide to add algae controllers such as shrimp or algae eating fish. Careful selection, research, and opinions from an experienced aquarist who is knowledgeable about natural aquariums will serve you best. Whatever your aesthetic preference, natural aquarium care is easy and rewarding. 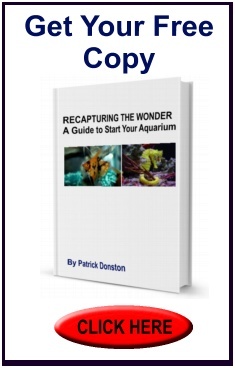 A great economic way to learn is to set up a natural nano-tank (aquariums under 30 gallons). We have been doing nano-tanks for over 20 years at our shop in Clifton, New Jersey, so stop in and view one of the many we have on display. We would love to talk you through the process of setting up your natural aquarium! Looking to Buy Salt Water Aquarium Fish? Looking to Buy a Reef Aquarium or Live Coral? Looking for Aquarium Maintenance Services in New Jersey & New York?